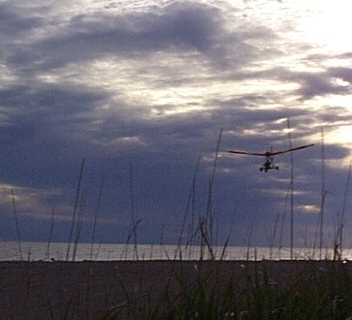 Here is a picture of the ultralight flying over the Gold beaches east of Nome. This is taken by Chris Rowe about 11 pm in August, during the period of twilight. In Alaska, an ultralight vehicle can be flown after Sunset until the end of civil twilight - a one to three hour period. The beach is real smooth and virtually deserted, so it is miles-long landing field. On the day the picture was taken, the wind was out of the east about 7 mph, right down the beach! Absolutely perfect conditions for UL'ing.